The air outside may be getting colder, but the indoor track remains nice and toasty. It’s time to break out the spikes. Coach Bob Hepler and Associate Coach Erick Camodeca are readying the EMU track team for their inaugural indoor season. This will be the first opportunity for the coaches to work closely together as they train sprinters, throwers, jumpers, hurdlers and distance runners alike. The coaching duo is focusing on togetherness for their athletes in an intentional way that isn’t often seen in track programs. At least one full-team practice is held each week, and as the coaches say, “Teams that practice at 6 a.m. on a Friday together win ODACs together.” This exciting new season will put that time-honored adage to the test. Last year, the men finished sixth in the ODAC, while the women finished seventh. Hepler and Camodeca just completed their first cross country season together with the Royals. Hepler came from the University of Texas at Tyler, where his teams won 16 American Southwest Conference Championships during his 14 seasons. Camodeca coached teams that won two Middle Atlantic Conference Championships during his five seasons at Stevenson University. The Royals begin their season at the Bast-Cregger Invitational at Roanoke College on Friday, Nov. 30-Saturday, Dec. 1. The conference championships are hosted by Roanoke College on Sunday, Feb. 24, and the season wraps at NCAA National Championships in Boston, Mass., on Friday, Mar. 8-Saturday, Mar. 9. How would you recap 2017-18 in a couple of sentences, and how does that play into your teams for this year? EC: Not being here it is difficult to answer. From the outside looking in finishing the year with two athletes at the outdoor National Meet, with Connor Faint finishing 3rd overall seemed fitting to end the year. Returning Grant Amoateng (Bristow, Va./Patriot) and his experiences at two NCAA Championships will help this team grow. BH: We are very grateful to Coach Ken Nafziger for stepping in and holding things together. The hiring process for Coach Cam and I continued well into late spring. We will build upon his dedication and gumption. Were there any key losses from last year’s team? 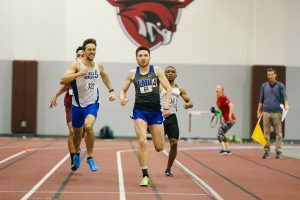 Connor Faint during the 2018 indoor season. EC: No team can replace Connor Faint. What he did last year was truly amazing, and I am sure we will see him in EMU’s Hall of Honor in 10 years. With some transition in coaching we saw some young sprinters leave the program who would have really helped the program. Who are some top returners we can expect to hear about this year? EC: Grant Amoateng will headline the men’s team this year in the horizontal jumps and make a name for himself in the sprints as well. We hope Justin Odom‘s (Williamsburg, Va./Menchville) hard work during the offseason and practice will turn into top notch performances. BH: On the distance side Justice Allen (Waynesboro, Va./Waynesboro) will make a big splash in the steeplechase and will outlast the competition in the 5000m. Derrick Chirinos(Harrisonburg, Va./Harrisonburg) will surely break on through to the other side in the 800 and 1500 meter. EC: Tajah Miller (Waynesboro, Va./Waynesboro) is looking to get back to where she was her freshman and sophomore year in the sprints. A late start to the season does not look like it will slow her progress. Another sprinter to look out for is Ania Summers (Stevens City, Va./Sherando). She will be our short sprint specialist. Toni Doss (Damascus, Va./Holston) is chasing down both the hammer and weight throw records this season. BH: Our distance women will be a strength. They had a very strong XC season and are in good shape for continued improvement. Laurie Serrell (Harrisonburg, Va./Harrisonburg) (800 & 1500), Elizabeth Nisly (Bluffton, Ohio/Bluffton) (5000), Abigail Shelly (Collinsville, Miss./West Lauderdale) (1500 & 3000) and Emma Hoover (New Carlisle, Ohio/Tecumseh) (5000) are all set for an excellent season. We also expect Megan Good (Harrisonburg, Va./Eastern Mennonite) to rejoin the team after her secret mission to the Oregon Territory in the fall. Who are some of the potential ODAC-point earning newcomers this year? EC: Coy Jimenez (Edinburg, Va./Central) and Alijah Johnson (Upper Marlboro, Md./Frederick Douglass)in the sprints 60m-400m and relays. Wade Banks (Basye, Va./Stonewall Jackson) may find himself picking a few points in the high jump and hurdles. EC: Michaela Chowning (Urbanna, Va./Middlesex) is a dynamite athlete and will score points in any event she decides to compete in. Look for her in both the long and short hurdles, long sprints, and specifically in the high jump. What are your expectations for Grant Amoateng this year? What are your thoughts on the men’s team as a whole? EC: Our main goal for Grant is move into a full leadership role for the entire team. For a while Grant has watched some strong leaders have success at EMU: Now it is his turn as a leader. 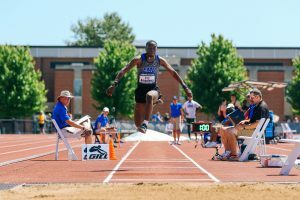 I do not think it is so much our expectations as much it is Grant’s expectation to qualify for the NCAA Indoor Championships for the first time in his career, and to return as All-American and school record holder in the triple jump. There is a fresh crop of young talented men on this team. This core group will be able to accomplish some great things as individuals but more importantly as a team. What will be the strong areas for the women’s team this year? EC: The women’s team will be fairly balanced this year. As far as strength in numbers, our distance program has a lot of talent and returners coming back. I think we will see a standout from each event group, which is exciting and will help build this program. What are some goals for the team this year? EC: Improve upon everyone’s personal best from last year. Building individual confidence, accountability, and instilling a winning attitude. If everyone can take on these challenges this team will see drastic improvement. On the men’s side we would like to see Grant Amoateng end his career with All-American honors in the triple jump, and potentially become a national qualifier in the long jump. EC: Improve upon everyone’s personal best from last year. Building individual confidence, accountability, and instilling a winning attitude. If everyone can take on these challenges this team will see drastic improvement. We are looking for the next woman or women to become the face of the program at the national level. As you rebuild, what can we expect out of you and the athletes in your program? EC: Consistency, accountability, and trust! If we have this across the program, we will achieve many of our athletic, academic, and life goals. BH: You can expect stability and dedication. Coach Cam and I plan to be here for many years. I plan to be in this job until I die on August 3, 2066. What is your overall considerations for the team in 2018-19? EC: Ultimately the 2018-19 season will be all about establishing the culture of the program going forward. 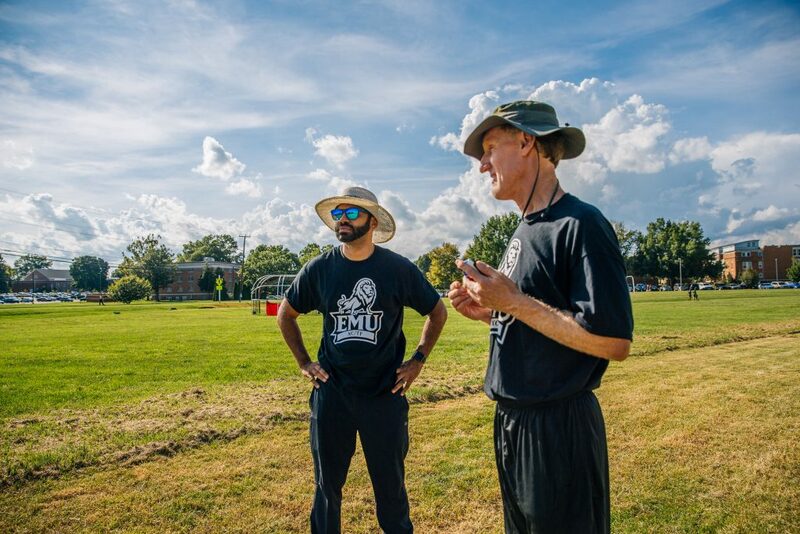 There has been a lot of success on the individual level at EMU, our goal is to now develop a program that will continually compete for ODAC Championships and place at the National Meet. In this brief period of time we have seen a lot from this team when it comes to ability to overcome challenges, and change. We know we have the right student-athletes here. We will be small, but definitely leave an impression at this university, conference, and more. BH: 2018-19 is the ultimate fresh start. We are blessed to have some strong individuals who weathered a couple of rough years. Additionally, seven top athletes will be on cross cultural including the fast Isaacs (Alderfer and Andreas). All that means that Coach Cam and I will get to spend more time with individual athletes. We are recruiting hard for the coming dynasty, and we are building a culture of excellence. I am incredibly excited to be at EMU.